Create your own must-have! 4-colour and 8-colour palettes are waiting to be personalised. 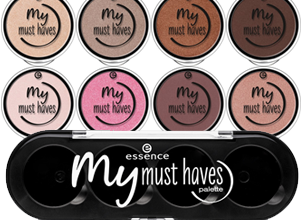 Simply choose your favourite colours from 20 eyeshadows, 5 blushes. and 3 lip powders – also included: a pink lip base for the lip powder, a highlighter and a bronzer as well as fixing powder. Use the special click-mechanism to place them in the multifunctional palette. Availability: From Clicks, Dis-Chem, and selected Red Square and Pick n Pay stores. I was delighted to receive this adorable eye shadow palette to test out. The packaging was really cute. My favourite was the peach party shade. It gave my eyes a subtle shimmer, without being too intimidating. The raspberry frosting shade also worked really well against my light skin tone. The black as a berry shade was the least favourite of mine- simply because I am not a fan of darker eye shadows – this shade is perfect for those who want a more edgy/goth look though. The shadows have good staying power- after a long night of hanging out, it was still looked fresh on my eyes. I would definitely recommend this kit to anyone looking to spice up their makeup. What’s really great about this kit is that you can choose your own shades to fit into the nifty little palette. I thought that this concept was extremely smart and quirky! I was chuffed that one could purchase the ones they like the most and create their own unique palettes :) I also like that there are 2 different sized palettes. I chose shimmery shades – Stay in Coral Bay; Cotton Candy; Apricotta and Strawberry Smoothie. I was actually disapointed by the glitter shades as the glitter is only in the top layer and once it is gone then there is just a normal matte shade underneath :( The shimmer shades were pretty but not as pigmented as I would have liked and a little chalky. They emphasize texture sadly. I think this was a great idea, but was not pleased with the shadows I chose. I have always had a problem with buying palettes and only using 1 or 2 colours. The best part is you can refill them when they are finished, all of this for a good price wow! Now this is what I’ve been waiting for, a palette that I could create myself instead of buying 2 different palettes only to use 2 or 3 colours. Essence is already my go-to so I’m a loyal fan and they just keep on upping the bar and releasing wonderful personalised products. I absolutely love this. I absolutely love this product! I have my own 8 pan palette which I am able to easily take with me with my favourite eyeshadows, blush and bronzer – all in one! The eyeshadows blend easily and are very pigmented. I really like the fact that I can choose what I want in my pallet. Such a good buy for an amazing price!